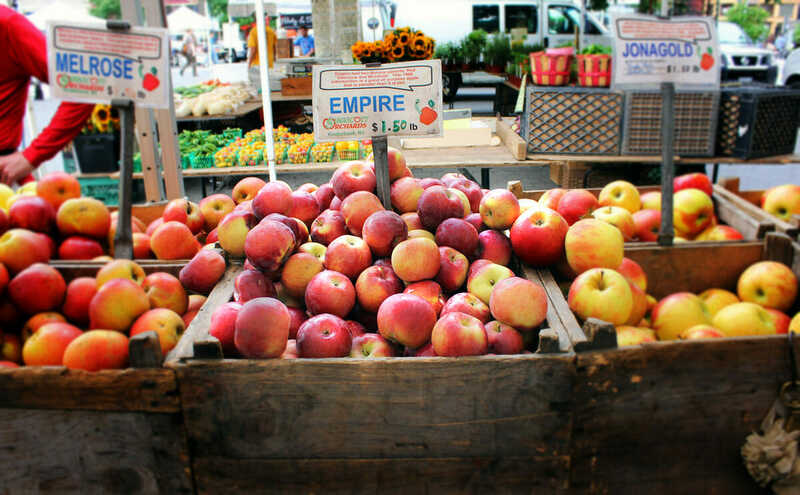 Why the apples you buy at the farmers market may be up to a year old and yet still taste delicious. For smaller producers, however, they see plenty of life in those old apples in the barrel. Far from loading their into the cellar for the winter, farmers – even small- and medium-scale ones – are increasingly using a wide range of technologies to extend the storage life of their apples and keep them in the market longer. The state of New York has a long history with post-harvest technologies to extend the lives of apples. Jim Allen, president of the New York Apple Association, a nonprofit trade group representing over 600 commercial apple growers, shares an early story of apple cold storage: In the 1800s, producers exported apples from New York State to Europe in wooden barrels. The barrels were filled tightly with apples, sealed and placed in the holds of old sailing vessels for their journey overseas. Months later, the apples were delivered firm and crisp. Gary Mount, of Terhune Orchards in Princeton, New Jersey, started out with a strikingly similar cold storage system for the apples on his 200-acre farm: a room under the farm store, with a small natural spring running through it and a vent for warmer air. This kept the humidity high and the temperature low. Nowadays, Mount talks about his apple storage facility in a tone that borders on giddy – and with good reason. In 2010, he built what he calls his “dream apple storage” in a new barn. The barn houses refrigerated storage as well as one room of “controlled atmosphere storage” (“CA” for short). Controlled-atmosphere storage, a sophisticated technology, controls not only the temperature at which the apples are stored, but the atmosphere as well. CA storage techniques for apples were pioneered in the U.S. by Dr. Robert Smock at Cornell University, who started his work in the 1930s. In CA storage, apples are sealed in an environment that is around 2 percent oxygen where temperature, humidity, nitrogen and carbon dioxide are all carefully regulated. “Apples breathe,” as Allen puts it – and the deeper they breathe, the longer they’ll live. Controlled-atmosphere storage slows their breathing, which consequently slows their ripening. Controlled atmosphere storage artificially makes the room perfect for the apples’ long winter nap. Regular refrigerated storage is good, but CA storage is better. Apples ‘breathe’ and controlled-atmosphere storage slows their breathing, which consequently slows their ripening. For a long time, Mount was advised against doing CA on a small scale and was told it wouldn’t be cost-effective. However, he had always looked up to an apple grower in southern New Jersey, Coles Roberts in Burlington County, who was doing small-scale CA over 30 years ago. Now Mount has the only CA storage in New Jersey and cites direct marketing, selling directly to the consumer, as a contributing factor to making his CA feasible on a small scale. If controlled-atmosphere storage sounds expensive, it’s because it is. Craig Kahlke, who works on fruit-quality management for the Lake Ontario Fruit Program of Cornell Cooperative Extension, started work last June on a grant from New York State to fund up to 50% of refrigerated storage for up to 65 farms. The grant had over 120 applicants. Christopher Brian Watkins, associate director at Cornell Cooperative Extension’s Agriculture and Food Systems, maintains that smaller producers can overcome the problem of investment by working with other growers. A number of growers might form a cooperative and rent a single CA room to store their apples together. For farmers unable to afford CA rooms, there are other alternatives, albeit ones that may raises eyebrows at an organic-friendly farmers market. Josh Morgenthau, owner and operator of Fishkill Farms, “a low-spray, environmentally friendly orchard,” in Dutchess County, New York, does not have its own CA storage on site. Morgenthau rents CA space from a nearby farmer to supplement the two new refrigerated-storage rooms on his farm. He has also used SmartFresh, which is mixed with water and released as a vapor into the apple storage. SmartFresh’s active ingredient, 1-methylcyclopropene (1-MCP), blocks the apples’ ethylene receptors, temporarily preventing them from ripening. As he does with any new technology, Morgenthau did quite a bit of research before deciding that SmartFresh was something he wanted to use his on his Eco Apples, which aren’t certified organic. (SmartFresh cannot be used on organic apples). SmartFresh biodegrades naturally and doesn’t leave a residue. He now calls it a “great tool” to keep local apples in the marketplace longer. For farmers like Morgenthau, cold apple storage – in whatever form – means keeping income coming in during the lean winter months. For apple eaters, it means being able to bite into a crisp, sweet apple nearly any day of the year.